Andrea Lennon is an “on the go” kind of girl who loves Jesus, Andrea is a Bible teacher whose life calling is to teach women to know the truth, live the truth, and share the truth. Her passion is honest conversation about the topics that drive our messy, everyday lives, and how we can always weather the storms through the love and power of God and His Word. 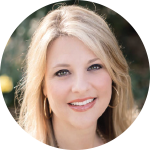 Andrea is a 2004 graduate of Southwestern Baptist Theological Seminary. She has written and published Reflecting His Glory: From Conformity to Transformation, Free To Thrive: 40 Power-packed Devotions for Women on the Go, On the Road with Ruth, and God in the Window. Andrea hosts a weekly radio program called Truth on the Go with Andrea Lennon. She also serves as the Women’s Ministry Specialist for the Arkansas Baptist State Convention. She is the founder of True Vine Ministry and lives in Arkansas with her husband, Jay and two sons, Jake and Andrew.